Obstacles will always be present—in life, and in real estate investing. But the good news is, there is also always a solution. Even better, if you’re willing to be optimistic, difficult situations typically present an opportunity to learn and improve. 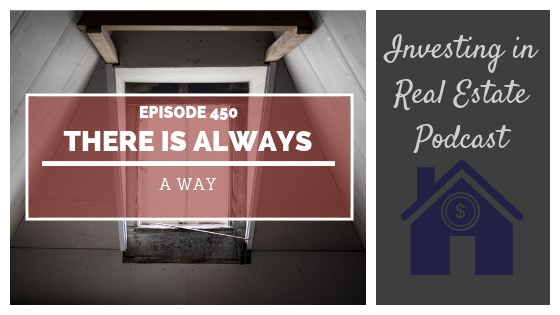 On this episode of Investing in Real Estate, you’ll learn about the inevitable problems that arise in real estate investing and how to overcome them. I’m sharing a personal struggle with some of my rental properties. You’ll also learn about the inspiring Theodore Roosevelt, and how he overcame many obstacles throughout his life. Don’t miss episode 450! How Theodore Roosevelt overcame multiple obstacles. Why evictions and vacancies should be expected in real estate investing. The two different ways to react to difficulties. My personal experience with real estate problems. How to turn a challenge into a lesson.